One great thing about the Homes for Sale in Bellagio in Bakersfield CA is the community size. The Bellagio gated community is located off Hageman and offers a quaint community with pool. As with many homes in Northwest Bakersfield, this development offers great schools for it’s homeowners. There is an HOA associated with this property due to the gated security and pool. Homes in the Bellagio community were built between 2001 and 2003. Most homes in the area are midsized and offer the typical amenities. The location of this area is highly desirable and with most of NW Bakersfield you’ll get newer shopping centers, great restaurants and updated parks nearby. Current prices for homes in the area come in at $348,900 with most homes selling between $260,000 and $358,500. Typical square footage for the homes in this community range in size from 1,421 to 2,700 with layouts varying from 2-4 bedrooms and 2-3 bathrooms. Average price per square foot for homes sold in the area is $130. Exterior elevations in the community will most be made up of Mediterranean/Spanish style. Although the Homes for Sale in Bellagio in Bakersfield CA comes with HOA fees ranging from $140 to $170 you do get some bang for your buck. The community is very clean and offers a fully gated community with large pool and spa area with security. If you’re looking for a niche area in Northwest Bakersfield that offers some of these features while being centrally located in NW Bakersfield then this just might be what you’re looking for. The average home in the Bellagio community offers 2,300 square feet of living space with 4 Bedrooms and 2 Bathrooms. You won’t see large or even medium sized lots in this community as most of the homes take up the majority of the yard. Owners typically have concrete paths around the house and a concrete patio available off the family room and kitchen areas. Most homes come with at least a 2 car attached garage. There are great schools nearby, Discovery Elementary School will serve students from K-6 and offers a five star rating from Greatschools.com. Junior High students in grades 7 and 8 will take advantage of Fruitvale Junior High that comes in with a 3 out of 5 star rating. Lastly, high school students wont have far to travel as the school is right across Hageman. High school students in grades 9 through 12 will go to Centennial High School which offers a 4 out of 5 star rating. Pricing in the last 12 months for this area came in at homes selling for an average $300,000 with the average days on market being 75. 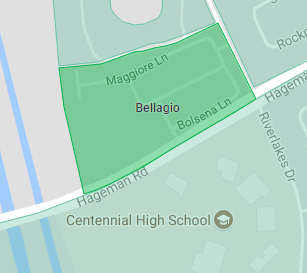 Homes in the Bellagio community usually sell for 98% of their asking price and taxes for this area come in at $3,443 annually. If you’d like to learn more about Homes for Sale in Bellagio in Bakersfield CA then please feel free to contact us anytime. Additionally, you an leave a comment below. I’ve lived in Bellagio for the past 14 yrs. There is a community pool, but NO SPA. Homes cannot be sold as rentals. The CCRs have restrictions in place so as the current rentals sell they cannot be resold as rentals. Our HOA fees average $160 a month which pay for gated security, pool service, common area and front yard landscape maintenance, front yard tree trimming, private street maintenance, as well as othe expenses incurred to maintain the property. The community has 59 homes.